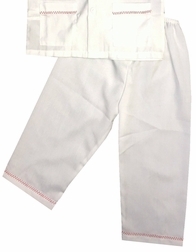 Here is our adorable white long sleeve pajamas for little boys perfect for Christmas eve, Christmas card pictures and Christmas morning! They are made by Sweet Dreams and are adorably trimmed with a red zig zag stitching. The pajamas button down the front and have pockets in the front. Looks precious with a red monogram on the left side of the chest or one of our specialty monograms.